Private equity firm Cerberus Capital Management took control of Chrysler Group on Friday in a $7.4 billion deal designed to set the beleaguered 82-year-old automaker on a path to recovery as a private company. DaimlerChrysler AG of Germany, which also builds Mercedes luxury cars, agreed in May to transfer an 80.1 percent stake in Chrysler to New York-based Cerberus. Daimler will retain a 19.9 percent interest in the company. "We as Daimler employees have already made our choice. And I am sure the coming years will confirm that we've made the right decision," DaimlerChrysler Chairman Dieter Zetsche said in a letter to Daimler employees. DaimlerChrysler is to be renamed Daimler AG, according to a statement from the company. Shareholders are expected to ratify that change at a meeting Oct. 4 in Berlin. Former Chrysler executive Wolfgang Bernhard, a senior adviser to Cerberus, was expected to be named chairman of the board of directors of Chrysler Holding LLC. 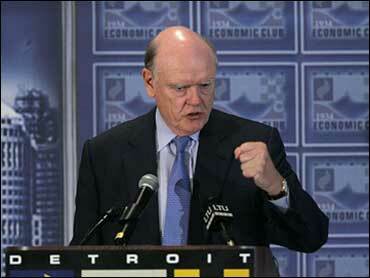 Chrysler Chief Executive Tom LaSorda was to continue to run the company's day-to-day operations. Although Bernhard frequently has been seen on Chrysler's headquarters campus, Cerberus Chairman John Snow has said Cerberus plans to keep the same management team in place and give it the freedom to implement its restructuring plan. Snow has said LaSorda can draw on experience of Bernhard and other Cerberus advisers as he works to restore Chrysler to profitability. Snow also said that with the closing, Chrysler is free of the short-term quarterly earnings pressures that public companies face, since there will be no Chrysler shares. DaimlerChrysler shares will change to Daimler, but otherwise shareholders won't be affected. The sale ends a stormy nine-year combination of Daimler and Chrysler, which combined in a $33 billion deal that was hailed as creating a global giant. Instead, Daimler, like competitors Ford Motor Co. and General Motors Corp., found itself battered by rising pension and retiree health costs in the United States. At the same time, Mercedes was stumbling due to quality problems and consumers were turning away from Chrysler's stable of trucks and sport utility vehicles as gas prices spiked. Chrysler made $1.8 billion in 2005 but lost $618 million in 2006 and $1.98 billion before interest and taxes in the first quarter of this year. DaimlerChrysler didn't report second-quarter earnings for Chrysler because of the impending sale. The losses brought on the sale and forced Chrysler to announce a restructuring plan that will use buyouts and early retirement offers to shed 13,000 hourly and salaried jobs in the U.S. and Canada by 2009. Combined Chrysler, Dodge and Jeep sales were down 2.3 percent overall in the first seven months of 2007, according to Autodata Corp. Jeep was a bright spot, with a 12 percent increase in sales thanks to the new Jeep Compass crossover and Jeep Patriot, a small sport utility vehicle. Chrysler should get a boost this month when it introduces the redesigned 2008 Dodge Caravan and Chrysler Town & Country minivans, which include a second-row seat that can spin 180 degrees to face backward. The Cerberus deal was sidetracked last month when bankers marketing a $12 billion Chrysler debt sale to major institutional investors ran into turmoil in the mortgage industry that weakened demand for leveraged loans and high-yield debt. With no investor appetite, seven banks led by JPMorgan Chase & Co. had to keep most of the debt on their books. The banks will front about $10 billion as a loan. They could come back to the market after the summer when investors are more active. Cerberus and DaimlerChrysler will fund the other $2 billion. As part of the deal, Cerberus agreed to invest $6.1 billion in Chrysler and its financing arm and to pay DaimlerChrysler $1.4 billion. DaimlerChrysler would remain liable for certain expenses that could result in it paying Cerberus up to $1.5 billion to complete the transaction. Cerberus, however, has agreed to take on most of the auto company's approximately $18 billion in long-term retiree health care costs.